Its hard to believe that its only the first month of Spring right now. We've had a few scorchers already and its starting to feel like Summer is long to be a long and hot one. While I enjoy the extra daylight and the bounty of fruit, veg and flowers and beautiful beach days that summer brings, I cannot cope with HOT days. Last weekend was one such scorcher, thanks to the second heatwave of the season. I don't know about you, but on such days, I cannot even think of putting the stove or the oven on, much less standing near it. I think I see a lot of salads and sandwiches for lunch this Summer. 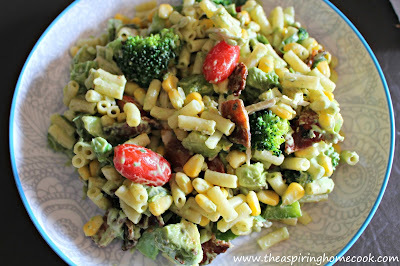 I tried out this amazing Avocado Pasta Salad over the weekend and it was a big hit. There is a little stove time involved to boil the pasta and to fry the bacon, but the end result is so good, I'd say it was well worth it. 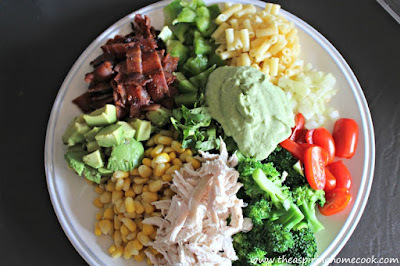 I can't wait for the next potluck or picnic, because I know that this salad will make an appearance. The dressing is an avocado based one and is super easy to make. If you have an immersion blender, you life will be even easier. If not, just use your regular blender and you'll be sorted. Basically all the ingredients for the dressing get blitzed together and ta-da .... you have yourself a salad dressing. I love recipes that are as easy as this. The ingredient list for the salad is just an approximation of what I used. Feel free to adjust as needed. Boil the pasta till al dente, following the package instructions. Run under cold water to stop the cooking process and to cool the pasta down. Drain and set aside. Blanch the broccoli florets in boiling, salted water till it is a vibrant green, about 30 seconds to a minute, depending on how crunchy you like your broccoli. Immediately drain and immerse the broccoli in ice cold water for a few seconds to stop the cooking process. Drain and keep aside. In the same pot of boiling water, boil your sweet corn kernels till done. Drain and set aside. Get your salad ingredients ready. For the dressing, simply blitz all the ingredients together. Toss the salad in the dressing and refrigerate for about 1 hour before serving. Pin now and try later!! !